Picatta is like an instant fancy dinner. One second you’re just sitting there, all normal like, but the instant that first forkful of lemony wine bliss touches your tongue you’re transported to candlelight and tablecloths, even if you’re sitting in front of the TV watching Dancing With The Stars. This version is made with chickpeas which make it superfast, and it’s served over arugula for some green. I know lots of people are accustomed to picatta with pasta, and that is the Italian tradition, but my first picatta was as a vegan and we vegans loved our mashed potatoes, so that is what I suggest serving it with. If you’d like to bulk it up even further, try a grilled or roasted portobello. Nutritional info is listed down below. Preheat a large heavy bottomed pan over medium. Saute the shallots and garlic for about 5 minutes, until golden. Add the breadcrumbs and toast them by stirring constantly for about 2 minutes. They should turn a few shades darker. Add the vegetable broth and wine, salt, black pepper and thyme. Turn up heat and bring to a rolling boil and let the sauce reduce by 1/2, it should take about 7 minutes. Add the chickpeas and capers to heat through, about 3 minutes. Add the lemon and turn off the heat. If serving with mashed potatoes, place the arugula in a wide bowl. Place mashed potatoes on top, and ladle picatta over the potatoes. The arugula will wilt and it will be lovely. If you are serving solo, just pour right over the arugula. I made this recipe this week for me and my hubby ( omni all the way!). I loved it and so did he! I cannot wait for this book! So good, quick, easy, healthy, and gone. I made this on Sunday night for dinner and I really felt like an honest-to-goodness grownup. It was so delicious and pretty easy to make, and as I made it just for two, we’ve already had a few meals out of it. Thank you! I’d venture to say that I am Isa’s number one fan 🙂 Three cheers! Made this dish Monday night for my omnivorous fiancé and vegan me, and we both agree it was exceptional! Very rich, flavorful, and it stayed warm nicely. This was my first time making a white wine reduction, and I may have let it reduce too far, but it worked out fine nonetheless. The arugula is a nice pairing. The fiancé wanted his over penne, which I cooked on the side and added to the reduced and simmering sauce over the heat to warm. I shy away from white potatoes because their glycemic index is high, and instead had mine over creamy-thick brown rice. Do all the recipes in Appetite for Reduction come with nutritional info? Made this last night! So wonderfully delicious! Can not wait for the book to come out (Asked for it for Christmas)!!! Making the onion rings this weekend and the black-eyed peas tomorrow. YUM!! Thanks for sharing a few recipes early! i’ve made this THREE TIME since getting the book. it’s so easy and i found it’s even really tasty if i’m out of capers or greens to set it on. i even like it cold on toast for breakfast! This rocked my world, and it was so freakin’ easy to put together. Thankies! Salt is mentioned in the recipe instructions, but not in the recipe itself. How much salt should we add? I’m guessing one teaspoon. Whoops, yeah, just salt to taste since broth varies so much and there are capers. Oops, I meant to say salt is missing from the ingredient list. No matter – I just made it and it seems salty enough from the capers and vegetable broth. Isa, I want to try this recipe but I hate the taste of wine! Can you recommend something else to add which will add flavor and depth but not taste like wine? Thanks! Try veggie broth with a few splashes of balsamic vinegar (1 to 2 tablespoons). Just made this last night for valentines dinner and it was a hit! I thickened the sauce with a corn starch slurry but other than that I followed it exactly and we fought over the leftovers for lunch. Thanks again! Made this last night and served over mashed cauliflower instead of potatoes. It was awesome! Only downside is that we finished the whole thing… no leftovers. Next time I’m so doubling it! I made this tonight with the mashed potatoes and it was fantastic! I only had a 25 oz. can of chickpeas so I just threw them all in. I was a bit nervous because I usually find canned chickpeas to be stiff and gross in recipes that call for just warming them, but they taste so good in this! I love the fancy reduced sauce that is so thick and flavorful and so easy to make. Yum yum….. So fast and easy… I know what to do with my left over mash from now on. Added fresh basil and parsley which enhanced the lemony goodness just perfectly. Sounds yummie. I am trying that one tonight. So good, and even BETTER the next day!!!!!! Isa – I would like to download your new book on my ipad – do you have plans to enable this? Thank you for this book!!!! I bought this book recently and have been cooking my way through. Everything’s been coming out great, and I’m so psyched to keep plugging away at it. 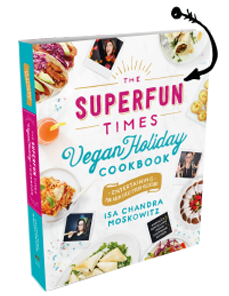 Just before I began cooking from this book, i cooked through vegan brunch, and while it was completely delicious, it is now a nice relief from some of the heavier recipes I’d been preparing. I can’t believe how many recipes there are! Definitely keeping me a busy and not bored vegan! I owe it all to you, Isa! This recipe sounds really amazing, I will make it for dinner. Oh I didn’t even know that! Here the breadcrumb/caper/lemon/wine sauce makes the piccata. Doesn’t matter: it tastes incredible! I had to try it yesterday and ate for two, oops. Thanks for the perfect recipe. Looks good. I’d love it if you could also add total carb count to the nutrition info. this looks superb and I wanna try it, but I can’t have garlic what would be a good substitute to add flavor or would it be just fine without it? Wow… I think this must be the most delicious thing I have tasted this year. Really, really great. This was the first vegan meal I have made and it was amazing!!! It’s nice to find excellent vegan recipes to help me get into the life style easier. Wow! You always remember your first. Glad it was a success! Oh, Isa!! After nearly 4yrs of being vegan, my Hubby has finally made a commitment to do the same:) He adored this recipe!! Even my teenage boys gobbled it up! The whole family is finally meat and dairy free!! Hooray! Between this, and your pumpkin muffins, they have been easy to win over!! PS: any suggestions on the mashed potatoes? I haven’t tried soy milk in mine before…just EB and some veggie broth…? What do you do? @ninab – pour in soy milk. Mash. Simples. Amazing Isa. Just had this. Wife had drunk all the wine in the house so I subbed for a splash of white wine vinegar. Was perfect, filling, grown-up grub, in about 15 minutes. Beautiful. This was so delicious and incredibly filling. I made it with the mashed potatoes. I bought enough ingredients to feed 6+ and my grocery bill was $15….I can’t wait to buy the book! OMG this is to die for.Lemony succulent goodness..serve it exactly as she suggests– over arugula and mashed potatoes..heaven………. Just made this tonight. Absolutely delicious!!!!!!!!!!! made this today on the first day of snow in omaha… and it’s perfect comfort food! Just made this in Sunny Florida! We all loved it, so easy and filling. Two thumbs up! This is one delicious dish! It tastes so light and good that you think you can eat a lot more but it’s surprisingly filling and satisfying. I made this with the caulipots recipe and one serving of each will do the trick! Is there a substitute for arugula? I am having a difficult time finding it. I’ve checked a natural foods store and walmart (gasp) but no such luck. Is no one who wouldn’t like this recipe. So many flavors — from the lemon, the capers and especially the arugula . Should have doubled the recipe. This is SUCH a great recipe! I made a lot of alterations based on what I did/did not have in my fridge and it still was delicious. I used quinoa instead of mashed potatoes, kale instead of arugula (sauteed it a little bit first because I knew it wouldn’t wilt as much as arugula), water instead of veg broth, added some tofu in with the chickpeas, and had NO lemon. Despite all of this, it was a tremendous success. My omnivore boyfriend was also a huge fan. Thanks team PPK! 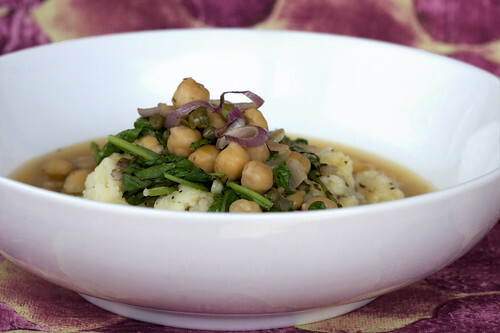 Chickpea Piccata « the taste space – steam, bake, boil, shake! This was delicious! Healthy, filling and super tasty! Served with baby spinach and mashed parsnips… yummers! I want to try this recipe but I hate the taste of wine! Can you recommend something else to add which will add flavor and depth but not taste like wine? Thanks! More veg broth and a splash of balsamic? I had no wine left when I made this last night so I just added extra broth, a little extra caper brine and lemon juice – tasted just fine! I have to say, I come to this recipe again, and again, and again. I also have blasted this recipe all over facebook. I’m obsessed. Nom..
What might this delicious dish pair with I suppose a nice Chardonnay as called for in the recipe, but I wondered if there was a red that might go well. Maybe a syrah or even a cabernet Franc? I have to confess that I HATE capers. I have spent a lot of time avoiding food that contained them, or pleading with restaurants to leave them out. Despite this, I followed this recipe EXACTLY as written…and I was glad. This was really yummy and easy to make. DOUBLE BONUS! I could easily see serving this at a dinner party to omnis with no problem. The only change I would make is to put the mashed potatoes on the bottom, followed by the arugula, then the picatta. Because my potatoes (Isa’s Fluffy Mashed Potatoes) were finished a bit before the picatta, they were not hot enough to wilt the arugula. But, all three made for a great taste combination. Wow! This was absolutely amazing. Really really good. My capers were off so I used sun dried tomatoes. My whole family ate their faces off. Prep was simple and quick and so this will definitely taking a place in my dinner rotation. Thanks Isa! Great!! Loved it, my mom loved it, too!! Awesome, awesome, awesome! This is so amazing. I use sun dried tomatoes instead of capers (Just cause I had them). I’ve made it twice and it’s divine. And so fancy. I makes me feel like a real chef. My kids love it too. Thanks Isa! Cooking extravaganza weekend | Fork off, heart disease! Layered Taco Salad | Fork off, heart disease! What an amazingly tasty, satisfying yet simple dish. Thanks again Isa for providing me with something delicious to make for dinner. And thanks for being so generous with your recipes. Wow this was really good! When I read the recipe I wasn’t too sure on it, but when I read the comments I thought it was worth a shot.. Fantastic. Really good over wilted greens without starch. Light and fresh. Appetite for Reduction is by far my favorite cookbook. Yum to everything we have made. unbelievable. thanks so much for another spectacular recipe. I had TWO servings! Would this make a good salad entree for my Christmas dinner, or is it best as a side dish? Holy hell this was amazing!! Followed directions exactly and served it with your mashed potatoes and arugula. The flavors were amazing!! This is an excellent meal to serve to non-veg’s. the sauce is so so good. make w mashed potatoes or have bread on hand to sop it up. will definitely make again. i just have to say that my husband (who btw NEVER cooks) made this for us for Valentine’s Day dinner and it was DELICIOUS!!! you’re right that the meal feels a little on the fancy side, but is simple enough that a cookng novice can handle it. so awesome. made this for dinner last night and the big bee and I just had the left overs. This dish is amazing over crash potatos. Mixed in some kale, broccoli and cauliflower. Thanks from two part time vegans. awesome dish – from a prior chicken picatta afficionado! Onion swapped in for shallots, a touch of chipotle hot pepper, and I threw in some broiled seitan chopped into little pieces. I spent the rest of the night walking around saying, Ooooh, that was SOOO GOOOOOOD. Oh, and no capers, either. Loaded the bad boy up with thyme instead. Loved it! Served it over pasta and arugula- divine. Can I just ask – is the calorie count with or without the mashed potatoes? I have this on the stove right now, and not only does it smell delicious, but I have been able to prepare it all myself while socializing comfortably with my brother and my partner. We’re going to serve it over quinoa, and I added oyster mushrooms. Perfect. This was great. I served as suggested over arugula and mashed potatoes. It was very quick to put together. My 12 year old daughter really liked it but wants me to make the sauce over the chickpea cutlets next time. I made the cutlets a couple of weeks ago and they were a big hit. OMG! Having this for lunch and there’s a party in my mouth! I think I can actually make it through the drudgery of work this afternoon with a smile. Thanks PPK! Substituted baby kale for the arugula. YUM! I’ve made this recipe a million times. It’s my go-to, and I mix it up by using spinach, kale, or arugula for greens, and millet, rice, potatoes, quinoa, etc. for grains. very versatile! This is the most delicious use for mashed potatoes I have ever discovered. Thanks! Hello there, just became aware of your blog via Google, and found that it is truly informative. event you proceed this in future. A lot of people might be benefited from your writing. understand. It seems tooo complex and extremely broad for me. de mención. Los vegetarianos estrictos tienden a tener niveles de carnitina escasos nulos. 1 successful solution is the Volume Pills. I’ve made this many times, but I just subbed lima beans for chickpeas and it was extra delicious! This is probably a twice a month recipe in my house. Almost weekly in the winter I use more wine, and let it reduce. Also add some mustard to the sauce. Then I serve it over vegan colcanon (mashed potatoes with wilted kale, leeks, and cabbage.) We’re not even vegan, but chickpea picatta is loved by the carnivorous adults, the vegan friends, and the fussy preschoolers. Yummy yum yum yum yum. Definitely a spork kind of dish. Hi there very nice blog!! Man .. Beautiful .. Amazing .. I’ll bookmark your web site and take the feeds additionally? Cheap to make, easy to cook, and uses ingredients I have on hand. Most importantly, it tastes delicious. I make this recipe often and my family love it!